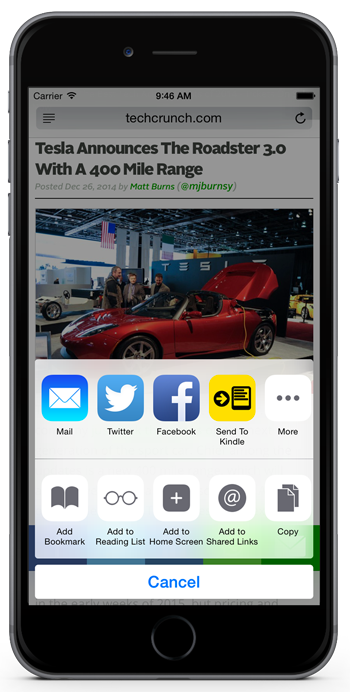 Comfy Read is an app and a cloud-based service that let's you send web articles right from your iPhone, iPad or iPod Touch to your Kindle reading device or Kindle apps installed on various devices you own. Starting with iOS 8, Apple introduced Share Extensions, that allow applications that are updated to take advantage of it to share content from one app, to other apps beyond the ones supported by iOS like Twitter and Facebook. Once you've purchased Comfy Read and you tap the box-and-outward-arrow Share button on Safari and many, many other apps, you will likely see a "Send To Kindle" option. Tap it and the web article you just shared is on it's way to your Kindle. All you need to do to get Comfy Read working is a simple, 2-step process. 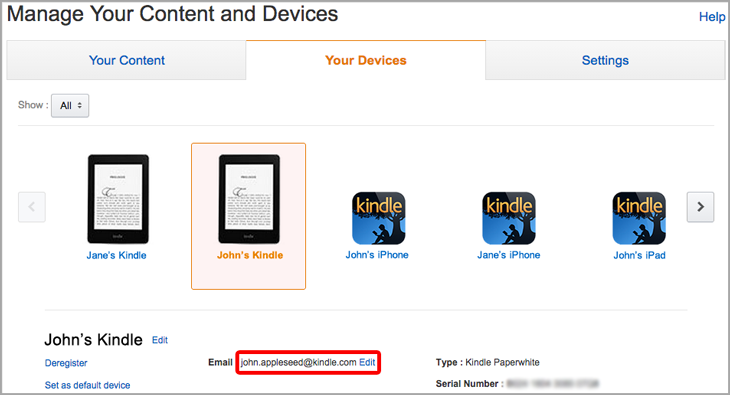 Every Kindle device you have, including Kindle apps installed on smartphones, tablets and desktops have an email address associated with them. Provide that email address to Comfy Read. 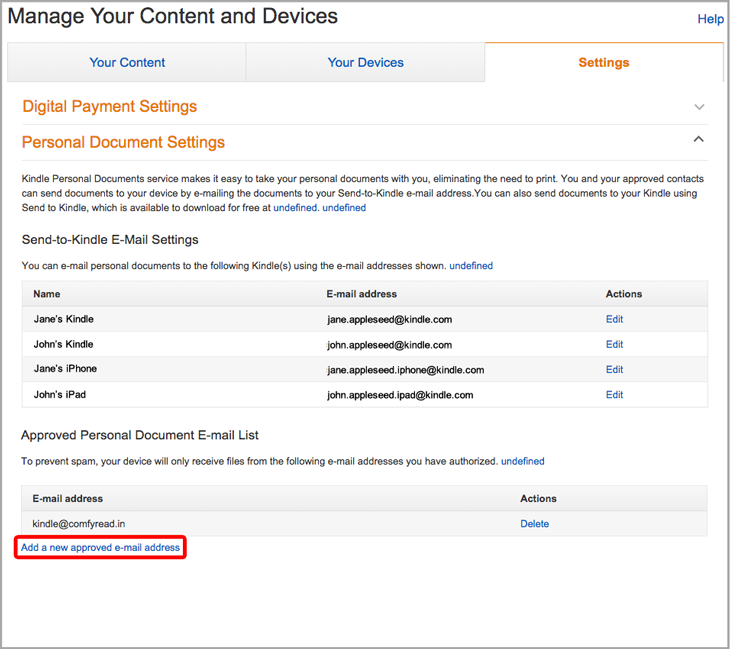 You can find your Kindle's associated email address right from the Kindle settings or from your Amazon Kindle management page. This two-step process is explained in detail here. If you still have clarifications or issues, please contact us. Viewed from mobile devices, the site is organized differently. The menu is hidden under the hamburger icon as shown in the following screen shot. Once you have your Kindle device's email address ready with you, enter the same in the Comfy Read app. 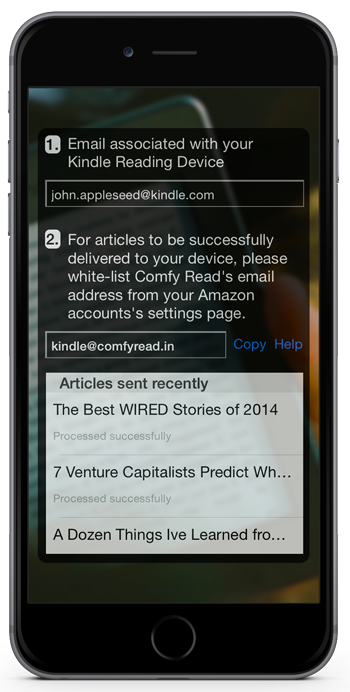 You are only one simple step away from using Comfy Read to send web articles to your Kindle now. To prevent just about anybody sending content to your Kindle, Amazon requires that you whitelist any email address that can send your device any content. 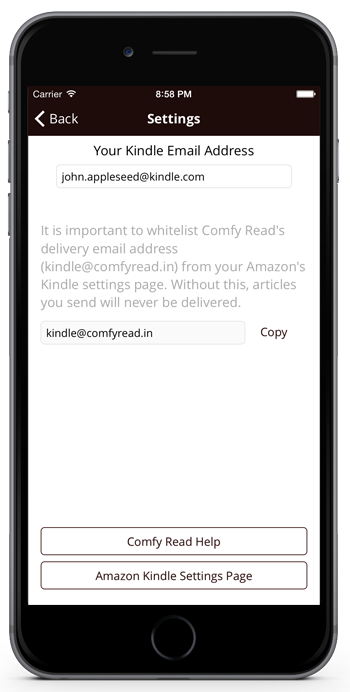 Comfy Read relies on email to send your Kindle the content you wish and to this end, you need to whitelist Comfy Read's delivery email address "kindle@comfyread.in". If you do not complete this step, your content will never reach your Kindle. Several apps now support iOS 8's sharing feature which allows one app to share content with other apps beyond the Twitter and Facebook options that iOS supported by default prior to iOS 8. When you now tap on the "Send To Kindle" option that appears, the article you shared will be converted to the right format and sent to the Kindle associated with the @kindle.com email address you provided.